The cottage has two bedrooms, master and single, with a modern bathroom and kitchen, combining an old world feel with up to date facilities. Fresh sheets, linen and towels are provided. Both kitchen and bathroom are fully equipped. The living/dining area has wood stove and while logs are not provided they are easily sourced locally. There is a small enclosed courtyard to the front and stone steps leading to a garden and patio/bbq area to the rear. RR sits in the centre of 3 local walks, Ilston woods with its Norman Church (and the Gower Inn), Parc le Breos with it’s Neolithic Tomb, and the outstanding Three Cliffs Bay. Please note-4 night minimum stay. Set in a picturesque valley of streams and woodland Rambler’s Retreat is a 200yr old stone built semi-detached cottage offering rustic charm with modern facilities. Parkmill is the gateway to the Gower Peninsula, the first area of Outstanding Natural Beauty. Ideal for ramblers/walkers the location offers two fabulous walks on its doorstep in Three Cliffs Bay and the Ilston Valley. The village boasts The Heritage Centre, a local shop and cafe in Shepherds and the Gower Inn pub and restaurant. The cottage has 2 bedrooms, a bathroom, kitchen and open plan dining and lounge. The kitchen is fully fitted with an electric cooker, microwave, large fridge freezer, kettle and toaster. Tea towels are provided. The lounge/dining room has a two-seater settee and armchair, a TV and DVD and a selection of books and games. The dining area has a drop leaf table and 4 chairs. The bathroom has a newly fitted shower, hand wash basin and toilet, is finished in stone with underfloor heating. 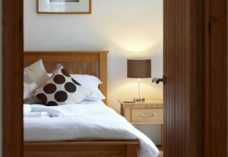 There is one master bedroom with a king size bed and wardrobe and drawers and a single bedroom sleigh bed with drawers. N.B. Access to the upstairs bedrooms are via a narrow spiral staircase. Bed linen and towels are provided. A cot and highchair are available on request. The cottage facilities include a large lawn and patio with rustic table and seating. Have special requirements? Call Mark and Janet Wild on 07495752548 or 01792 233342.